Thank you for reporting. We (Vallejo Flood & Wastewater District) will check it out. In the future, you can always report storm drain or sewer issues directly to us at (707) 644-8949, or use the Contact Us form on our website at www.VallejoWastewater.org. We have been out on the site, but haven't been able to locate the storm drain that you're referring to. Can you give us a more exact location? If it's easier, you can call us at (707) 644-8949 ext. 1702; that will get you to the department that is looking for it. Thanks! Found trash and other household items illegally dumped at City parking lot (H). Reported by CCRC Security. On the side of 1219 Marin Street in Overland Alley is a ton of dumped garbage bags and furniture. Also, other items on Overland Alley. 2 green bins across from Lincoln Rd. E. entrance to I80. On approach to California motel entrance. Thank you for using SeeClickFix. In order to better serve you, we need more information about the issue that you are reporting. Are you reporting illegal dumping? Are these household storage containers, recycling containers, or large waste debris boxes? Providing more detailed, specific information helps us to address the issue as quickly as possible. Photos - both up close and wider shots encompassing the area - are also helpful. Thanks again for using SeeClickFix. These are large green yard waste bins used by Recology. Located on Lincoln Rd. E. at entrance to California motel , below McDonalds. Previously reported. Green cart has been an eyesore on this motel's property for many years. Currently being used as a dumpster. Is there a reason why this cart cannot be removed? Thanks for reporting this issue! The Illegal Dumping Code Enforcement Officer has been notified of this issue and will start an investigation. 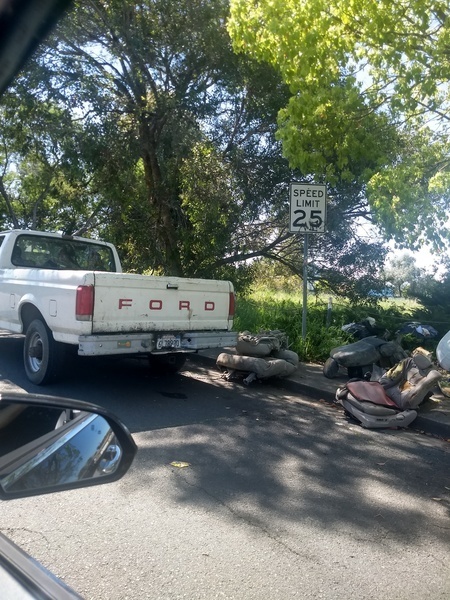 To assist the officer, please email IllegalDumping@cityofvallejo.net with any photos, video, suspect(s) description(s), vehicle make/model/license plate #, date/time/location of occurrence, and/or any other pertinent information (you may also call the Illegal Dumping Hotline with this information at 707-648-0445). SeeClickFix is one of the many tools available to the citizens of Vallejo to report non-emergency issues. We “close” an issue in SeeClickFix once we've acknowledged the complaint; however, this issue is not "Closed" per se; it will remain an "Open" case with us until it is corrected. If there is anything else we can assist you with, please let us know. 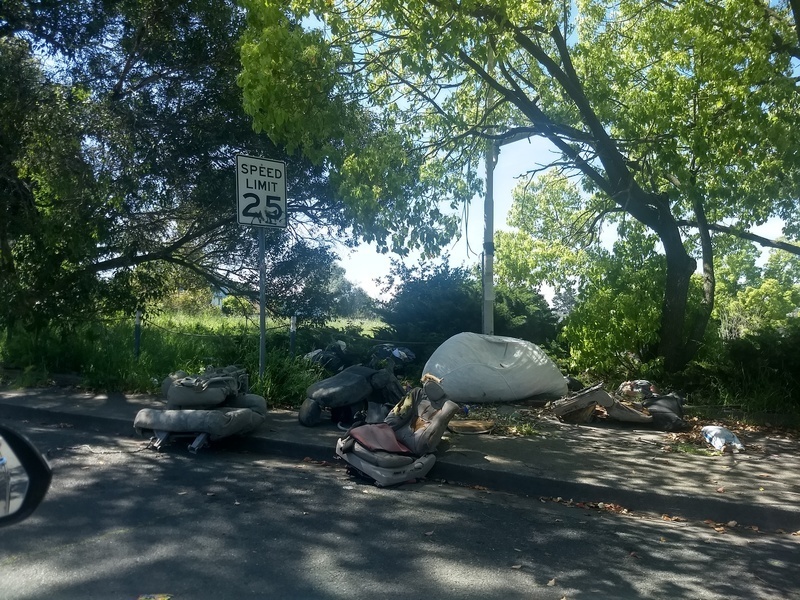 Depositing garbage and debris onto public property is a violation Vallejo Municipal Code section 7.44.100 which is a misdemeanor offense with a penalty of $1,000 fine and/or up to 6 months in jail. Please do not move garbage and debris from private property to the street or alley. Police caught somebody breaking in the other night but is still left open. People going through it still. Needs to be fixed. Thank you for using SeeClickFix. These fields and facilities are maintained by the Vallejo Little League. Please contact them directly as they do not monitor this forum and are not affiliated with the City municipality. Contact information for the league can be found on their website here: https://www.vallejolittleleaguebaseball.org/page/show/2327180-league-information. KB homes had many signs attached to city signposts along Columbus parkway that I reported and were removed..like last week. Unbelievably, there are now NEW ones..maybe half a dozen, from Lowe’s to Regents park. All attached to city signposts! Incredible! Perhaps calling KB directly and letting them know they are not welcome and that it’s an issue with the neighborhood. That might get it fixed faster and stop them replacing the signs after removal. Interestingly, I saw the signs on Saturday, today, Tuesday went the same trail and the signs were down! Not sure if City contacted KB or somebody in their office found out. Hope they don't attach any more to city signposts! Squatters on cement/ walled area near restrooms @ Independence Park, south waterfront MIW & Maine. That group is long gone, there’s all kinds other people there during the day, and evening. What I do think is hilarious: now a sign is posted there saying “no smoking, no vaping”. Who ever enforces that? SCF says the issue is closed but the problem still exists, why? What does it mean when someone else closes your report? Who do I contact about Garbage, Recycling and Yard Waste Services? Why is the water pressure so weak?